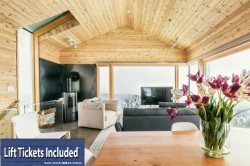 Powder Mountain Getaways, LLC is a property management company that provides short-term lodging accommodations and is hereinafter referred to as Manager under these Terms and Conditions and includes any amendments to the Terms and Conditions that Manager may publish from time to time. The term Guest refers to the guest, those invited by Guest, others that are invited to the property by Guest of Guests invitees. Guest hereby agrees to the Terms and Conditions below. BY ACCESSING, BROWSING, PURCHASING THROUGH OR USING THE SERVICES OF MANAGER, INCLUDING MAKING RESERVATIONS ON-LINE, BY PHONE OR BY ANY OTHER MEANS, YOU AGREE TO BE BOUND BY THESE TERMS and CONDITIONS. RESERVATIONS ARE NOT FULLY GUARANTEED: If for some unforeseeable circumstance, the Property is not available or becomes unavailable or uninhabitable during your stay, it will be substituted with accommodations with an equal number of bedrooms and bathrooms or is otherwise determined to be an upgrade. If the substituted property rents for more for the same period or remaining period, respectively, there will be no additional charge. However, if the substituted property rents for less for the same period, the difference will be refunded to the Guest. PAYMENT: An advance payment deposit equal to 50% of the total rental amount is required to confirm the rental property and to reserve the desired rental dates. Deposit must be received by Manager within 24 HOURS of Guest reservation or is subject to cancelation unless otherwise arranged for with Manager. The advance payment will be applied toward the room rent and associated fees. A credit card is required with all reservations for damage and incidental Guest charges. Please make deposit payments in the form of credit card, travelers checks, bank money orders, cashier’s checks or personal checks payable to Powder Mountain Getaways. The BALANCE OF RESERVATION is due tenty-one (21) days prior to the check-in date. Reservations made less than 21 days prior to the check-in date will require full payment via credit card, cashier’s check, wire transfer, certified check or money order and a valid credit card must be on file. If paying by check and check is returned for NSF, there is a $50 service charge per occurrence. Keys or entry code will not be issued until the final payment has been made and signed rental documents are in Manager`s possession. Manager may charge the final payment to the credit card, if any, used by Guest for the initial rental deposit or the credit card on file with Manager. Guest failure to pay the Final Payment in a timely manner may be considered a cancelation under this agreement and may result in forfeiture of the reservation deposit and the reservation. Manager cannot guarantee a specific unit or any unit if a cancelation occurs. Payments for foreign reservations must be made in U.S. funds by money order, wire transfers, or cashier’s checks payable on a U.S. bank. Unless otherwise specified all rates are quoted in US dollars plus any applicable taxes and fees. CANCELATION and REFUND POLICIES: Should Guest wish to cancel this agreement, notice of cancelation must be in writing and e-mailed to Manager. It is Guest’s responsibility to verify receipt by Manager. If cancelation is received more than ninety (90) days prior to check-in date, Manager will refund 100% of the sums paid, less a $50.00 cancelation fee. If the notice of cancelation is received within 90 days or less prior to check-in date and Manager is not able to re-rent the same unit(s) during the same time period at the same or a greater rate, 100% of the sums paid are non-refundable. If Manager is able to re-rent the property under essentially the same terms as the original rental, all paid amounts will be refunded less a $50.00 cancelation fee. There are no refunds for early departures, delayed arrivals, inclement weather or reduction in the number of nights reserved for any reason. If the subject property becomes unavailable or unsuitable for rent for any reason whatsoever, including but not limited to, casualty loss, construction delays, physical deterioration or loss of utility services, the Manager`s liability will be limited to the return of all monies paid on account at the time of cancelation. In the unlikely event Manager cancels your reservation; every attempt will be made to substitute the rental with an equal or better property or all monies received will be refunded to Guest within 5 business days of cancelation notice. Cancelation claims must be taken up with the travel insurance company, if a policy was purchased. OCCUPANCY: Guest understands and agrees that the Property shall be occupied by no more than the number of individuals including children (infants under the age of two are not included) as indicated on the Rental Listing. All of our properties are privately owned. PLEASE BE RESPECTFUL AND CONSIDERATE of the property and the neighbors in the other properties especially after 10:00 PM and before 8:00 AM. Loud parties, noise or any other disturbances will not be tolerated and deemed grounds for immediate eviction with no refunds. ABSOLUTELY NO PETS: In accordance with the Moose Hollow and Wolf Lodge Home Owner`s Association Rules, Guests are not permitted to bring pets. If pets are brought they will have to immediately be removed from the premises or the rental is subject to immediate termination and no refunds will be given. In the event the Guest chooses to terminate the rental, no refunds will be given. The HOA may also impose fines up to $500 per occurrence and a deep cleaning fee of $1000 or more may be assessed. Service animals are not considered pets but notice and proper documentation is required at the time of the booking. CHECK IN POLICIES: Standard check-in time is 4:00 PM. Early check-in is allowed only with prior approval. Property must be cleaned by housekeeping and ready for occupancy prior to check-in. Access Instructions will be provided to Guest two days prior to arrival if all rental fees have been paid. Upon Check-in, the Guest is required to report any issues or problems with the property(s) they have rented in-order to avoid being charged for damages that were caused by a past guest and will help us to keep the property in its best possible condition. HOT TUBS: For properties that have a private hot tub, be certain to review both the instructions to unlock and open the hot tub as well as the cover lift instructions. Safety is always the first priority and hot tubs must be closed and secured at all time when not in use to void accidental or unauthorized entry. Adult supervision is required at all times. CHECK OUT / CLEANING PROCEDURES: Check out time is 11:00 AM. If a Guest would like a late check-out, PRIOR APPROVAL IS REQUIRED. A $40/hour fee may be charged for each hour (or portion thereof) past the required check-out time. A $100 fee may be charged for a lost key, garage door opener and remote control. Each property will be inspected, sanitized and cleaned prior to Guest's arrival and after departure. GUEST IS REQUIRED to leave the property in the same general condition (less our routine cleaning) as it was in at Check-In. Specific check out instructions are emailed and also left in the unit which include the following: Turn heat down to 55 in the winter and A/C up to 80 in the summer. All dirty dishes must be loaded in dishwasher and started prior to leaving; remove and dispose of all trash. If additional cleaning is required, appropriate charges will be deducted from the security deposit (or charged to the credit card on file) at the rate of $30 per hour. Please lock unit, close and secure all windows, return key, if any, to the keybox and close garage doors (where applicable). Leave amenity lanyard, keys, FOB's remotes, etc., with the Guest Information stand found inside the property. CHANGES TO THE TERMS: Manager reserves the right, in its sole discretion, to change, modify, add or remove any portion of the Terms in whole or in part, at any time. Changes in the Terms will be effective when notice of such change is posted on the Terms and Conditions section of the powdermountaingetaways.com website. Your continued use of the property(s) after any changes to these Terms are posted will be considered acceptance of those changes. Guest should periodically check the Terms and Conditions link on Powder Mountain Getaways homepage at www.powdermountaingetaways.com to view the then current Terms. d. Guest fails to return/leave amenity lanyard, keys, FOB's, garage door remotes, etc. The unit must be left closed, locked and secured including all windows. NOTE: Blood, make-up, excessive dirt, grease, oil, etc., can destroy the linens and applicable fees may be charged.